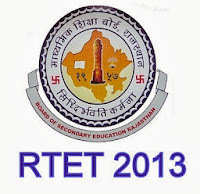 Rajasthan Teachers Eligibility Test (TET) www.examrtet.rajasthan.gov.in Exam 2013 will be held by Rajasthan Board of Secondary Education (RBSE), Ajmer on 29th December 2013 at various district across Rajasthan for those candidates who are looking forward to become teachers in lower primary and upper primary schools in Rajasthan state. RTET Level - I Exam ( Class I to V ) Held On 29/12/2013, Timing -11.00 AM to 1.30 PM. Elementary Education (B.El.Ed). OR Senior Secondary (or its equivalent) with at least 50% marks and passed or appearing in final year of 2-year Diploma in Education (Special Educaton). OR Graduation and passed or appearing in final year of two year Diploma in Elementary Education (by whatever name known). RTET Level -II Exam (Class VI to VIII) Held On 29/12/2013, Timing – 2.00 PM to 4.30 PM. Qualification: Graduation and passed or appearing in final of 2-year Diploma in Elementary Education (by whatever name known). OR Graduation with at least 50% marks and passed or appearing in 1-year Bachelor in Education (B.Ed). OR Graduation with at least 45% marks and passed or appearing in 1-year Bachelor in Education (B.Ed), in accordance with the NCTE (Recognition Norms and Procedure) Regulations issued from time to time in this regard. OR Senior Secondary (or its equivalent) with at least 50% marks and passed or appearing in final year of 4-year Bachelor in Elementary Education (B.El.Ed). OR Senior Secondary (or its equivalent) with at least 50% marks and passed or appearing in final year of 4-year B.A/B.Sc.Ed or B.A. Ed./B.Sc.Ed. OR Graduation with at least 50% marks and passed or appearing in 1-year B.Ed. (Special Education). How to Apply: Eligible & interested candidates should go through detail Notification link provided below and apply ONLINE through official website of RTET i.e. www.examrtet.rajasthan.gov.in from 24th October 2013 onward. Candidates have to pay required fee through E-Mitra Kiosk OR CSC across Rajasthan and Fill RTET 2013 Application Form, Upload Photo And Sign. Submit The Form & Save Application ID And Token Number For Future Reference.